Use this medication regularly to get the most benefit from it. To help you remember, use it at the same times each day. The dosage is based on your medical condition (especially kidney and liver disease), response to treatment, and other medications you may be taking. Be sure to tell your doctor and pharmacist about all the products you use (including prescription drugs, nonprescription drugs, and herbal products). Ask your doctor or pharmacist for more details. What conditions does Detrol treat? To prevent constipation, eat a diet adequate in fiber, drink plenty of water, and exercise. If you become constipated while using this drug, consult your pharmacist for help in selecting a laxative (such as a stimulant-type with stool softener). Tell your doctor right away if you have any serious side effects, including: vision changes, severe stomach/abdominal pain, trouble urinating, signs of kidney infection (such as burning/painful urination, lower back pain, fever). Get medical help right away if you have any very serious side effects, including: fast/slow/irregular heartbeat, severe dizziness, fainting. List Detrol side effects by likelihood and severity. Before using this medication, tell your doctor or pharmacist your medical history, especially of: problems emptying your bladder (urinary retention, bladder outflow obstruction), severe blockage of stomach/intestines (gastric retention), glaucoma, stomach/intestinal disease (such as ulcerative colitis, slowed movement of stomach/intestines), severe constipation, kidney disease, liver disease, a certain muscle disease (myasthenia gravis). The risk of QT prolongation may be increased if you have certain medical conditions or are taking other drugs that may cause QT prolongation. Before using tolterodine, tell your doctor or pharmacist of all the drugs you take and if you have any of the following conditions: certain heart problems (heart failure, slow heartbeat, QT prolongation in the EKG), family history of certain heart problems (QT prolongation in the EKG, sudden cardiac death). What should I know regarding pregnancy, nursing and administering Detrol to children or the elderly? Some products that may interact with this drug include: anticholinergic drugs (such as atropine, scopolamine), other antispasmodic drugs (such as dicyclomine, propantheline), certain anti-Parkinson's drugs (such as benztropine, trihexyphenidyl), belladonna alkaloids, potassium tablets/capsules, pramlintide. Does Detrol interact with other medications? 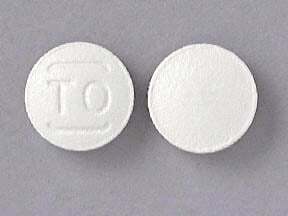 This medicine is a white, round, film-coated, tablet imprinted with "TO". 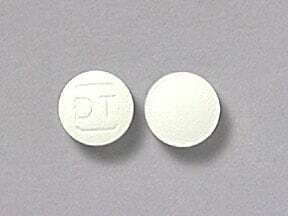 This medicine is a white, round, film-coated, tablet imprinted with "DT". Are you considering switching to Detrol? How long have you been taking Detrol?